Drawing by Sylvia Plath, Image via Mayor Gallery "I love people. Everybody. I love them, I think, as a stamp collector loves his collection. Every story, every incident, every bit of conversation is raw material for me." Image via Mayor Gallery "You have to be able to make a real creative life for Yourself, before you can expect anyone Else to provide one ready-made for you." "I can never read all the books I want; I can never be all the people I want and live all the lives I want." "And by the way, everything in life is writeable if you have the outgoing guts to do it. The worst enemy to creativity is self-doubt." "Nothing stinks like a pile of unpublished writing." "After something happens to you, you go to write it down, and either you over dramatize it, or underplay it, exaggerate the wrong parts or ignore the important ones. At any rate, you never write it quite the way you want to." CSU Archive "I must bridge the gap between adolescent glitter and mature glow." "I may never be happy, but tonight I am content." "If they substituted "Lust" for "Love" in the popular songs it would come nearer to the truth." Faber/ Via Huffington Post "Why are we conditioned to the smooth, strawberry-and-cream Mother-Goose-world... only to be broken on the wheel as we grow older and become aware of ourselves as individuals with a dull responsibility in life?" "I like people too much or not at all. I've got to go down deep, to fall into people, to really know them." Rex/ Via Huffington Post "Kiss me and you will see how important I am." Today marks the 50th anniversary of Sylvia Plath’s tragic suicide, but the year is also a milestone for Plath’s legacy. The renowned poet, who explored visual art and prose as well, released her classic novel The Bell Jar shortly before her death. 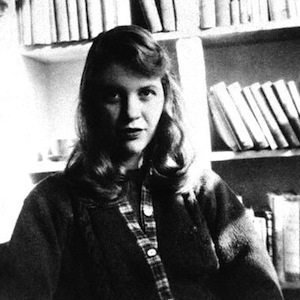 Between The Bell Jar, Plath’s journals, and the large catalog of poetry, old fans and newcomers can enjoy the tiny timeless bits of wisdom articulated in her endearingly identifiable manner. Take a peek at several timeless quotes taken from Plath’s work and correspondence in the gallery below. Paired with the quotes are photos of the late writer as well as several ink drawings by Plath, revealed for the first time at The Mayor Gallery in London in 2011.